Open from 5 pm on evening of events. A new lounge at the Bell Centre! Mythik is your new pre-event spot that is both comfortable and contemporary with an inviting and casual atmosphere. 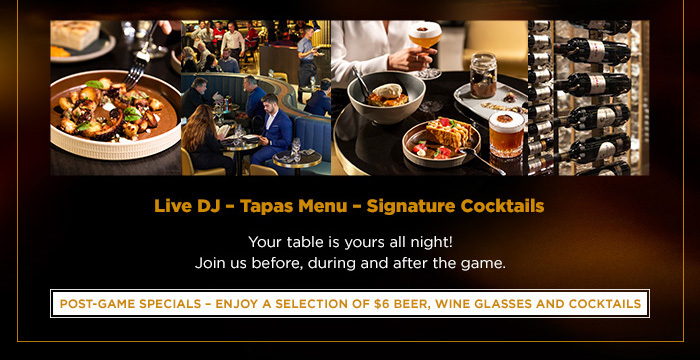 The food offering at Mythik is made up of tapas that is perfect to share with your group and pair well with a custom cocktail, meticulously mixed, stirred or shaken to your taste by our talented team of mixologists on site. Wine lovers can choose from a selection of over 800 bottles from the wine cellar or from a wide variety of offerings by the glass. Mythik is the new hot spot to enjoy and relax before and after the game or the concert. Come early to take full advantage of your experience at Mythik and beat the lines. © 2019 Centre Bell. All rights reserved.